This is the fifth part of a 15-part series. So far we’ve covered two kinds of keyword research, improving CTRs by writing better meta descriptions, and boosting rankings by consolidating duplicate content. [/av_textblock] [av_promobox button=’yes’ label=’Sign up here!’ link=’manually,https://www.ranksense.com/blog-list’ link_target=” color=’custom’ custom_bg=’#ffffff’ custom_font=’#1c98e0′ size=’large’ icon_select=’no’ icon=’ue800′ font=’entypo-fontello’ box_color=’custom’ box_custom_font=’#ffffff’ box_custom_bg=’#1c98e0′ box_custom_border=’#1c98e0′] This is part 5 of a 15-part series to help you improve your ecommerce site’s SEO. Sign up to be notified when a new tip is published! Our goal is to optimize store navigation elements for search engines. This tactic will help you align your store navigation with popular relevant keywords. We’ll research the keywords that are already bringing traffic into your category pages and look for opportunities to improve the SEO. However, be careful not to sacrifice user experience for SEO. User experience should be your first concern with your store navigation. 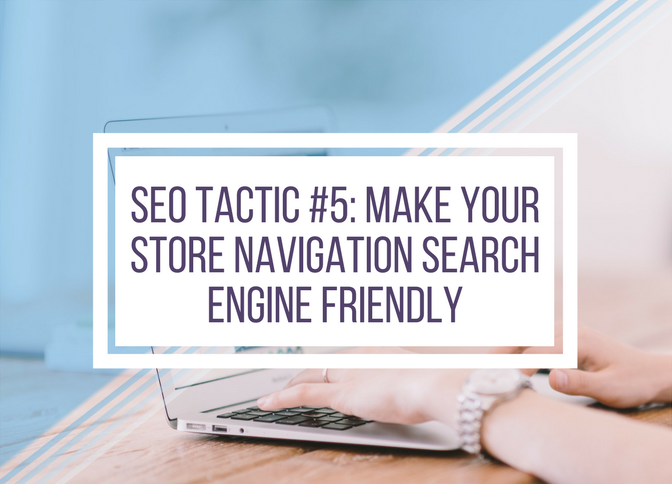 Once your store navigation is user-friendly, you can start working on making it search engine friendly. This tactic isn’t about re-organizing your navigation structure. I like to use mind map software like Xmind (available in both free and paid versions) to visualize a store navigation, but you can also use a regular spreadsheet if you prefer. Because users behave differently on mobile than on desktop, the two need to be analyzed separately. So go ahead and create a map for your mobile site as well, if it differs from your desktop site. I’ll focus on the desktop site in most of the examples below, but be sure to analyze your mobile site as well. Next, we’ll research the top keywords that are driving traffic to your category pages. In this step, we’ll check to see if the names of our navigation elements align with the keywords that are driving traffic to them. One clear benefit of matching our navigational elements to popular search queries is that the words will be highlighted in the search results. This makes it clear to both search engines and users that the page is directly relevant to the search term, which can improve both rankings and CTRs. Find the first category page in the list below or click “No filter” just below pages to filter the URLs for the category page. Brand names can be misspelt, so use the shortest text that you think will cover most branded search terms. Finally, check that the queries are sorted by the number of clicks in descending order. Find the top query and list it in your spreadsheet. Is the top keyword an exact match of the name in the navigation? Note that you need to lump together plurals, singulars and misspellings. If it’s not an exact match, is it in the top 3? Top 5? The lower it ranks, the more opportunity there is to improve. Are the top keywords teaching me something new and interesting? In my sheet, I’ve highlighted mismatches in yellow and promising opportunities to improve in orange (more on this below). Let’s get some additional data for the spreadsheet. This will help us to compare the site performance before and after you make changes. In the list of queries in Search Console, click the >> beside the top query. Check the boxes for impressions, CTR and position, and add columns for each to your spreadsheet. Fill in that data. In our example of Tiffany’s, we do not have access to Search Console because we are not affiliated with them, so I’ve used a third-party keyword tool to find this information. Ethically sourced diamonds – Visitors care whether their diamonds are ethically sourced, so this may be an opportunity to better target those visitors with existing content. Tiffany ring cleaning – The content on the Tiffany Concierge page does not closely match this query, but it does detail other services they offer. This reveals an opportunity to tweak the page content to take advantage of traffic that page is already receiving. Engagement rings under 2000 – Even though these visitors are looking for engagement rings, they are being taken to a jewelry category page – which excludes engagement rings on Tiffany’s site. However, Tiffany’s does not offer engagement rings in this price bracket, so they may not be a good match for these visitors. Wedding rings – It’s more common for visitors to search for “wedding rings” than “wedding bands,” so this would be an easy change. So you see, this process does not always reveal a straightforward name change. You may need to tweak on-page content, or just not worry about visitors who are searching for something that you don��t offer. You also need to take branding considerations into account when contemplating name changes. The Xmind software will allow you to add information onto any page, so you can enter your keyword research data directly into the mindmap if you prefer. This will provide the data that backs up your recommended navigational changes. Remember to repeat this process for the mobile version of your site. Identify changes that you want to test. For example, if we were Tiffany’s, we might change “The Journey of a Tiffany Diamond” to “Tiffany’s Ethically-Sourced Diamonds.” We recommend making one change at a time and monitoring for at least one month. Depending on how quickly search engines pick up changes to your site, you may need to wait two months to actually see the effects of the change. After a month or two, you can compare the impressions, CTR and rankings for each page by following the same steps as you did in Step 2. 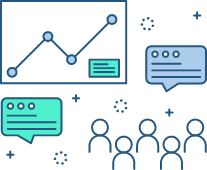 If your industry is subject to seasonal fluctuations, your impressions may fluctuate, so CTR and rankings are the most reliable KPIs. Also monitor the aggregate organic search traffic to the site before and after each change. Analyze the mobile site similarly. That’s all for this tip! I hope it helps you uncover some opportunities to align your store navigation with keywords that are popular and relevant. [/av_textblock] [av_image src=’https://www.ranksense.com/wp-content/uploads/2017/05/request-a-free-SEO-scan.png’ attachment=’5262′ attachment_size=’full’ align=’center’ styling=” hover=” link=’manually,https://www.ranksense.com/free-scan/’ target=” caption=” font_size=” appearance=” overlay_opacity=’0.4′ overlay_color=’#000000′ overlay_text_color=’#ffffff’ animation=’no-animation’][/av_image] [av_promobox button=’yes’ label=’Scan now!’ link=’manually,https://www.ranksense.com/free-scan/#scannow’ link_target=” color=’custom’ custom_bg=’#ffffff’ custom_font=’#1c98e0′ size=’large’ icon_select=’no’ icon=’ue800′ font=’entypo-fontello’ box_color=’custom’ box_custom_font=’#ffffff’ box_custom_bg=’#1c98e0′ box_custom_border=’#1c98e0′] What SEO problems are hidden in your site? Our free SEO scan checks for 52 common issues. You’ll receive a full report explaining the problems we find and how to fix them. We include an unclaimed revenue calculator to estimate how much your SEO issues are costing you. Get your free report today!